Major holidays usually result in an influx of new gym memberships. Unfortunately, over 80 percent of those new members cancel within five months, often due to costs and the realization that the services were not being utilized.Want to get fit? Here are seven benefits of ditching the membership game and having a home gym instead. Whether you just awoke or have wrapped up a long day of work, you are assured solitude in which to get ina workout. With a home gym, you do not have to worry about stares or judgment from otherswhether real or imaginedas being self-conscious about your level of training is not an issue when in private quarters. The convenience of having fitness equipment at home means you can work out based on yourown schedule. Take a few steps in the morning, get in a bout of strength training, and then easily transitionto the rest of the day. A cardio machine in your house allows you to raise your heart rate without having to find a parking spot or face a chilled walk to your car in nasty weather afterwards. You can also fit in short workouts throughout the day whenever yourtime allows without it creating a time crunch. When life makes your blood pressure rise, you can easily take a short break to pump iron or run cardio to relieve stress in a healthy manner. If yoga gets you Zen, roll out your exercise mat and stretch out all the angst. Gyms are a breeding ground for bacteria, with staph amongst the many contaminants that can be present. With your own equipment, you do not have to concern yourself with wondering about the cleanliness of strangers’ hands, and you can rinse off in your own shower without feeling the need for protective shoes. When flu season hits or a nasty bug is being spread about town, you can rest assured that you will notcatch it from workout equipment, taking you from healthy to ill in a single session. The average cost for a gym membership is over $600 annually. This is an ongoing charge, with benefits that end when your payments do. 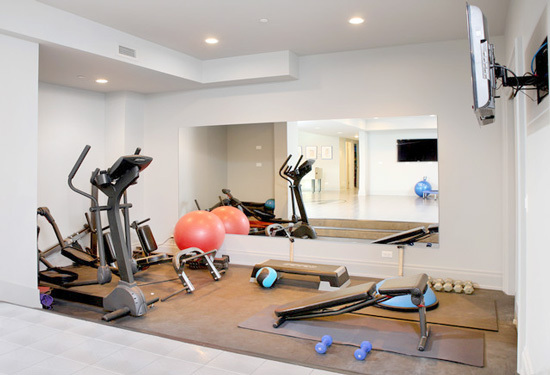 By setting up a space to work out in your own home, your financial obligation is limited to the purchase of weights, machines, and equipment such as mats, bands, and exercise balls. While you may incur occasional replacement costs, your initial investment will likely pay for itself within the first year or two. You can add pieces gradually or opt to finance to create the ideal space to fit your needs. At the gym there are plenty of distractions to keep you from completing the workout you desire. Whether it is time spent waiting for a machine to open up or engaging in small talk with other members, it is easy to lose focus on your end game. Use your own equipment to stay centered on the task at hand and complete your workouts in a timely fashion. Forget the bright, fluorescent lights and sterile environment of a group gym. Create your preferred ambiance and decorate in a way that is inspiring to you. For yoga sessions, set up a dimmer to provide a relaxed feel. If you like to workout with music blaring and bass pumping, include a surround sound system to set the tone of your workout without having to struggle with earbuds. Having a home gym allows you to take control of your fitness and health. Alleviate the guilt of yet another missed evening at the club with dollars going down the drain, and instead work out on your own terms.